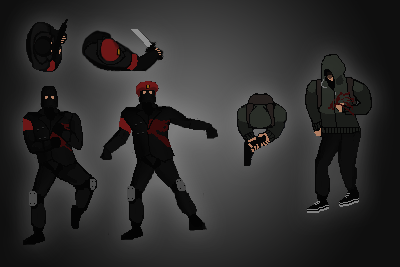 I've just finished a whole bunch of sprites for the main character, the companion and one enemy. This includes basic weapon types and a death animation. See below! Worth noting is the death animation is several frames of the character being thrown backwards, and then several different lying frames. There are "slumped" frames too for when the character is against a wall. This is a little buggy still, it works a lot of the time but still cuts through too many times. First of all, the partner character now reloads if under half clip when told to wait. So, before a big firefight, it's advisable to tell your follower to wait to allow them to reload if necessary, and then follow again once they're ready. I'm looking into a more elegant key for this, but I don't want there to be too many keys tying up the game. There's a dedicated follow/wait key, as well as a move key. These allow you to direct the follower around. There's also a "Face Direction" key, which lets you point them in a certain direction in order to prevent you getting ambushed and the like. A small one here, there's a dedicated weapon slot for the knife now. So you'll always have it. Unless you throw it, of course. I've made some rudimentary animations for the deaths of characters, they need work but it has more of an impact compared to just straight from standing to dead when shot. Downfall, Inc is a 2D, single-player, tactical top-down shooter. Centred around a series of escalating raids against political targets, the player and his wingman must fight in close-quarters against enemies armed in salvaged or stolen ex-military gear. Imagine a distorted version of our future, where the insane wealth of the global corporate bodies affords them more influence and power than the failing governments of the world. Between corruption and massive debt, public support for the state falters. As it fades, national services are privatised to stem the debt, and the corporate entities begin to carry the burden of healthcare, law enforcement and education. Much like political parties, different corporate bodies have more influence in different regions. Hostile A.I Update, and Friendly A.I Addition! I had somewhat of an epiphany today. 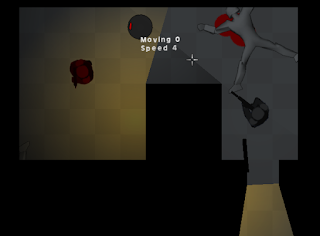 I'd been tweaking the enemy A.I, and it was at a smooth and functional level. I was play testing the game, and after a few attempts I started to notice a glaring flaw in the general concept. The idea of enemies not attacking or searching for the player unless they've seen him with a weapon drawn began to make less and less sense from a gameplay perspective. You always had the initiative, the surprise, and the advantage. Once you'd taken a shot, too, it descended into a brief gunfight. As there was no stealth system of any kind, it seemed entirely pointless. I just couldn't see it working on larger levels, as you'd be able to just walk through the map, kill the target and then run away. There was no real challenge, and enemies felt pretty pathetic. I decided, after this play testing, to abandon that side of the game and focus entirely on the tactical shooter aspect.